This is your opportunity to change the sport landscape in London forever. 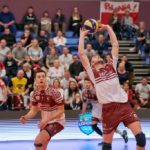 IBB Polonia London Volleyball Club invites you to an equity crowdfunding campaign, where you can not only be a co-owner of the volleyball club, but most importantly be a part of the global volleyball events revolution. Through know-how, experience, passion and investment we will build UK’s first professional volleyball club that put fans’ experience at the top. Imagine fast paced action of top family friendly sport, mix it with top DJs, the best music and entertainment and a top-level volleyball in English capital becomes a reality. Remember - winning feels better, when it comes with a story – click below and join us on a journey. It's impossible to achieve those aims without your support. We invite everyone to participate in the development of new quality – both of our team and volleyball in England as a whole!! Support us and be part of the club. We are looking to raise 4 million so that we can operate a fully professional sports club operation for the next 4 years, when we will be ready to generate other profits to create a sustainable and successful sports club.